Dallas BBQ is no favorite place of mine. If fact, I think its a big part of what is wrong with BBQ in New York. But I still manage to eat there on average of about once a week because of a deal they have that is just too good to pass up. Part of me feels like I’m screwing them over a little bit each time I get it. The deal is this: BBQ Sauce basted rotisserie chicken sandwich with fries, baked potato, or yellow rice, and cole slaw for $4.99. Of course their whole plan is to get you in there and convince you to drop $8.99 on a sugary frozen margarita. Amazingly though, this deal is even available for delivery or take-out, which is what I highly recommend. You can’t, however, order using their online ordering system, you need to call to order. You end up saving money on drinks and tip if you grab it to-go. Not that you shouldn’t tip your take-out server, but I tend to tip less than I would a waiter at a table. If you do decide to dine in and you just have to get a frozen drink, the best deal is to get a Texas size, add an extra shot for $1 and share it with someone. If you’re by yourself the regular size for $5.99 with the extra shot for $1 is an ok deal. Then you’re getting a meal and a huge alcoholic drink for about what you would spend on just a sandwich at most places. 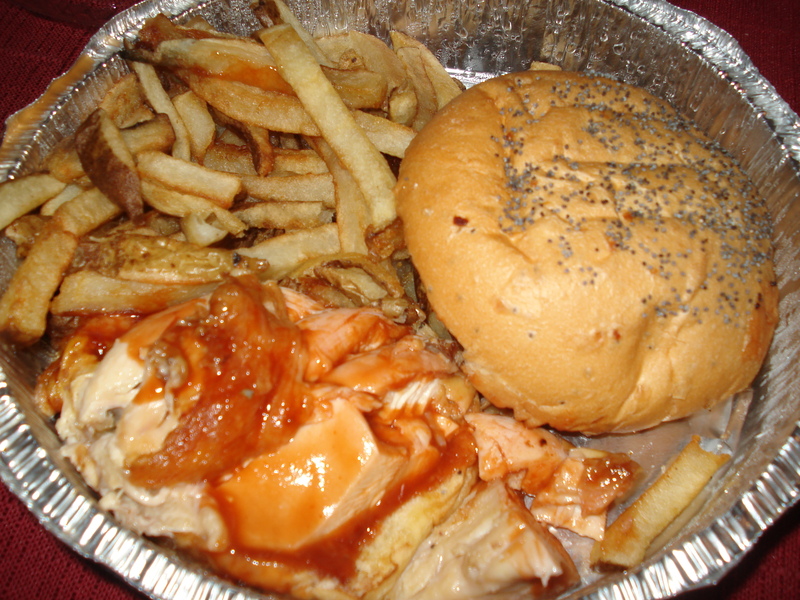 The sandwich is not really BBQ, its rotisserie; but it is smothered in BBQ sauce, so you can pretend. The fresh cut fries are pretty great, or for a slightly healthier option the baked potato is good sized. I don’t like cole slaw and when I ask them to skip it I think I usually end up getting more fries. The chicken isn’t amazingly flavorful, but it is extremely juicy and the sauce is tangy enough to make the whole package great. In my neighborhood (Washington Heights) great rotisserie chicken isn’t so rare, but I can imagine living/working around other Dallas BBQ locations where affordable lunches are harder to find (I’m looking at you Times Square and Upper West Side) the value of this deal increases 10-fold. Try it out and let me know what you think! I promise next week I will cover a REAL amazing BBQ place that was in fact the inspiration for the conception of this blog. I just wanted to give myself a chance to go there at least one more time before I try to capture the essence of the place. Stay tuned!